When most people think Florida, they think sun, beaches and hot temps. While that is a good summary of Florida outdoors, Florida indoors can be described as cold, icy and florescent. Well, at least at area ice skating rinks, that is. Check out these 10 best ice skating rinks throughout the Sunshine State. Located in the center of South Florida, the Glacier Ice and Snow Arena is an all-inclusive space to spend some time on the ice. Amenities included in the 40,000-square-foot facility range from a completely stocked pro shop, a snack bar, arcade room, party rooms and a locker room. Show off your athletic abilities on their NHL-sized rink, or on the only mini rink in South Florida. In addition to public skate times, the facility offers skating classes, hockey lessons, hockey leagues, and birthday party packages. Kissimmee has plenty of family-friendly activities, and The Ice Factory is a great inclusion to that list! Regardless of the weather, locals and visitors to the area can stop by for a few hours of ice-cold fun. This destination features a 750-seat stadium, along with two ice surfaces. Be sure to surf over their website, and learn about all skating activities, figure skating, birthday parties, hockey and more! Palm Beach Skate Zone is the only South Florida location that offers both ice skating and roller skating. While that sets them apart from other local skate lands, this skate zone offers United States Figure Skating Association (USFSA)-sanctioned lessons. In Northeast Florida, Jacksonville has all your ice-sports covered. Stop by the Jax Ice and Sportsplex for public skating and lessons. Plan your child’s party here, or enroll in a hockey class. The possibilities are plenty, and Jax Ice and Sportsplex is open daily. Space Coast Iceplex is in Rockledge, and is more than ice skating. While they do have the standard open ice skating times, hockey and figure skating lessons and free practice, they offer a few more perks. A fitness center, complete with an optional personal trainer is on site, as well as a sports bar. The Penalty Box Sports Bar is a great location to catch all the NHL fun and excitement. With the NHL package, the bar can have different games playing on their four TVs. The Iceplex is an all-in-one location for training, fun and a cold drink. Another location in Orlando, The Ice Den keeps a full schedule. 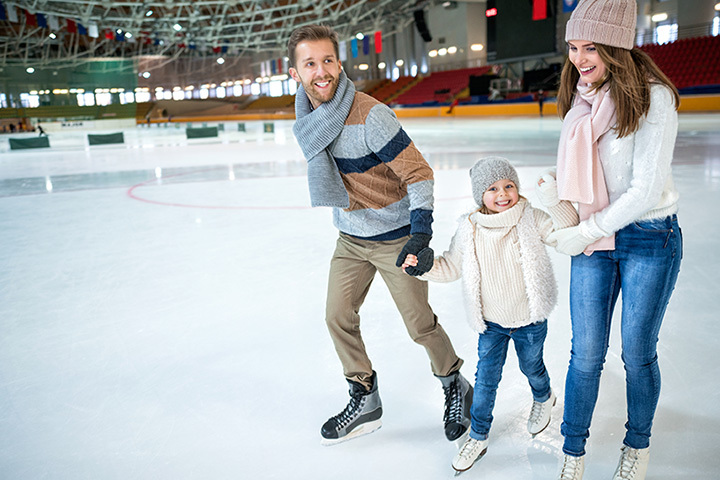 Ranging from hockey training and open rink, figure skating lessons, practice and blocks of time set aside for both ice skating lessons and open ice skating, there is something for every age and level. The Ice Den Pro Shop sells a wide variety of items, ranging from hockey sticks and pucks to figure skating dresses and tights. Youth hockey. Adult hockey. “Learn to Skate” programs. Figure skating. Birthday parties. These are just a few examples of lessons offered through Pines Ice Arena. Figure skating lessons range from freestyle, group lessons and/or individual lessons. Hockey leagues are available, and range from beginner to advanced, kids and adults alike. Youth clinics and adult clinics are also available. Pines Ice Arena prides itself on matching top-notch lessons with top-notch instructors, assuring that anyone can learn to have fun on the ice. Cars aren’t the only thing that bring speed to the arena in Daytona! Skaters can also take the checkered flag on the ice at this family-friendly ice skating rink. Speed skating clubs are available for kids, along with a different group for teens and adults. Ice Fit is another program offered, along with figure skating, hockey and open public skating. Dryland training, a synthetic ice hockey rink and a pro locker room are a few portions of the newly opened location in Clearwater. In addition to these amenities, guests to the facility can book birthday parties, participate in the “Learn to Skate” programs and practice hockey moves and skills. Kendall Ice Arena calls Miami, Florida home. With all the spice and sauciness in this prime city, getting back to artic ice rinks might provide a nice escape from reality. Take in a few laps during open skate, brush up on your skills with lessons, or maybe shoot for the hockey team. Kendall Ice Arena offers classes for all ages and interests. What sets this place apart is that it is the only ice skating rink in Miami/Dade County, and is the largest “Learn to Skate” program within the state of Florida. View more Florida Ice Skating Rinks.